During the winter months pet dander can be a issue. 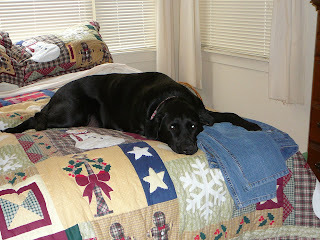 Kingers is a Black Lab with lots of dander. To help reduce the dander in my home I have found a few things that work. 1 - Wash your pet regularly - use natural shampoo. I take Kingers to the Pet Baths at our local car wash. The wash area is clean and warm. Then my hubby pulls up and King jumps into a warm Jeep and then into a warm house. 2 - If you have carpet invest in a good vacuum. Vacuuming regularly (daily) will help reduce dander. I have a Dyson and it works great. 4 - Air purifiers are also good to reduce pet dander. I do not use a purifier but I have family members that do. Personally I think regular baths with natural shampoo has helped the most with Kingers to reduce his dander. It is also makes him smell good and his fur has a marvelous shine.